This photo was taken in outer Mongolia (really). This part of the world feels truly lost from the rest of the world because the landscape is so vast. There is open space enveloping you with no paved roads or western infrastructure for as far as the eye can see. I was with a group of friends and our van broke down. In a place this remote a broken down vehicle is pretty scary. We ended up packing one by one into passing cars as they came along to get us to the next town. What was it like being by in that (presumably kind) stranger’s car by yourself trying to get to town to meet your friends? 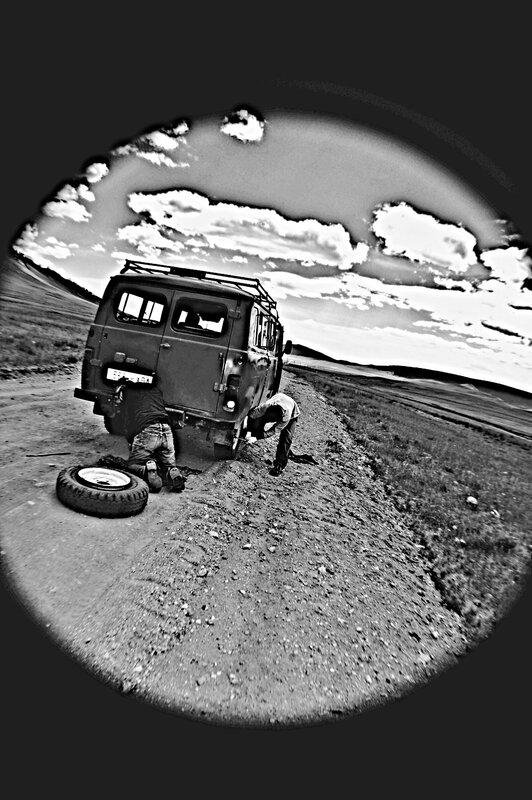 Mongolians are very friendly so it wasn’t a scary experience being put in a car with strangers. This is a normal occurence there – help out people along the way with car trouble. It was a little sad for me I couldn’t communicate very well since I don’t speak Mongolian and my Russian is very limited (I was in Macedonia for the Peace Corps so I speak some Macedonian which is also a Slavic language – kinda like a Spanish speaker understanding some Italian). My friend Megan who I was visiting there speaks Mongolian so she explained everything!